Data loss prevention (DLP) is an intelligent service that’s part of Microsoft Office 365. 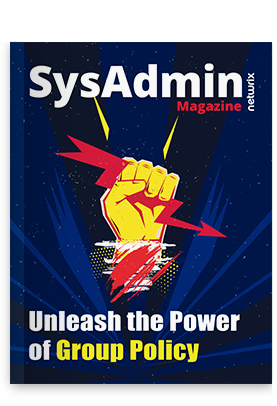 It looks for messages, files and documents that contain sensitive information and applies the policies you configure about what can and cannot be done with that data. The most common types of sensitive information an organization would want DLP to look for include credit card numbers, Social Security or insurance numbers, and other personally identifiable information (PII). DLP includes 87 built-in sensitive information types, and you can also create your own custom sensitive information types if you need to identify and protect specific content for security reasons or to meet compliance regulations. The service uses DLP rules and policies to determine whether text is likely to be sensitive information. When users try to interact with that data, the service applies the policies you configured. For example, it might log an audit event for later review; display a warning to the user saying, in effect, “hey, this looks sensitive — are you sure you want to be doing that?”; or block the action completely. 1. Go to the Security and Compliance Center in the administrative portal at https://protection.office.com/?rfr=AdminCenter#/homepage. 2. 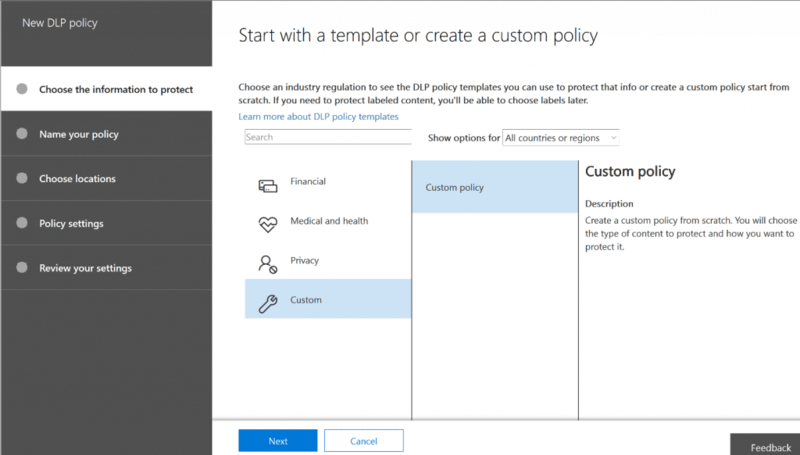 On the left, click Data Loss Prevention, and then in the right pane, click Create a new policy. 3. For our purposes, let’s click Financial and then S. Financial Data. Click Next. 4. Give the policy a name and description. Click Next. 5. 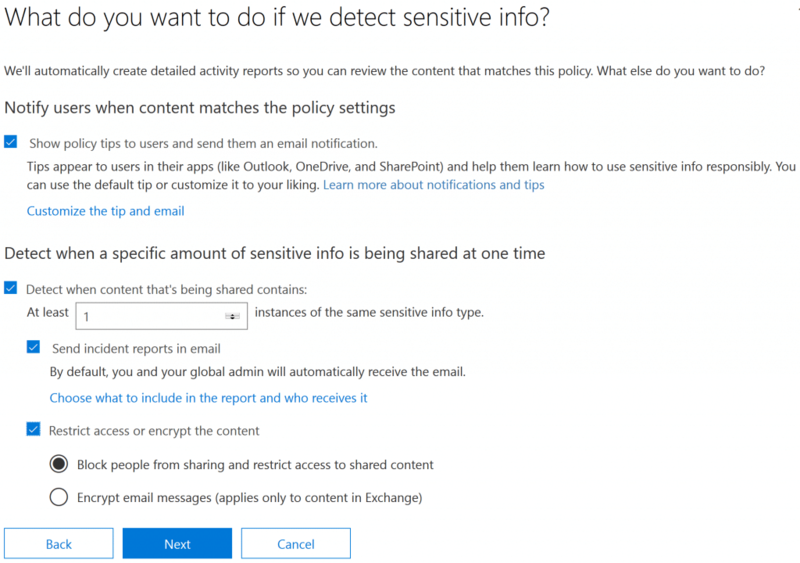 On the “Choose locations” page, pick what parts of the Office 365 service this particular data loss prevention policy will be enforced in. For this walkthrough, let’s choose All locations. Then click Next. 6. On the next screen, you can customize the types of information this policy will apply to. In most cases, you will want to accept the defaults, at least initially. In this case, we’re looking for financial information such as credit card numbers, U.S. bank account numbers and routing numbers, and for our protection we want to know when anyone attempts to share this content with people outside our company. Click Next. 7. Next, you’ll be asked what methods of enforcement you want to use. You can choose to simply show policy tips to the user, which will just inform the user that they’re working with sensitive information, or you can select to notify different people or block actions. For our purposes, let’s change the number of instances required to 1 — even one credit card number leaked is too many these days — and choose to block people from sharing the content. (If your business model requires sharing of this type of sensitive data, you could use the DLP policy to automatically encrypt it before it is sent out; you’d just check the last box on this page.) Click Next. 8. 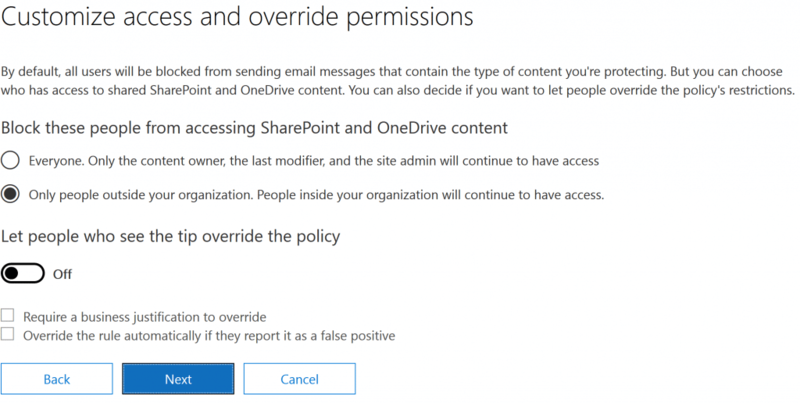 On the next page, you can choose to block certain people from accessing SharePoint and OneDrive for Business content and whether and how users can override the DLP policy. 9. 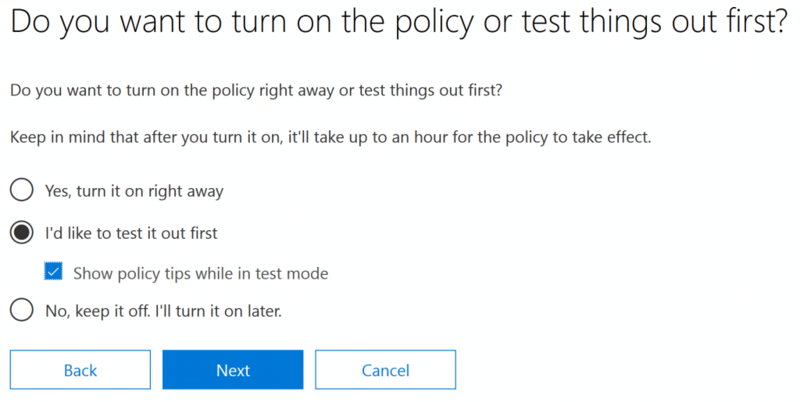 Finally, you can choose whether to run the policy in test mode or begin enforcement immediately. I recommend using test mode for a while to make sure you won’t adversely affect user workflows. Test mode flags policy matches but doesn’t actually prevent any content from being sent — it is like a “what if” mode that shows you what content would trigger a policy. You can also instruct Office to show tips in Outlook while in test mode for user edification. 10. Review your settings and close the wizard. To understand how DLP affects your organization, you should review how often your users tried to send content that matched a DLP policy. 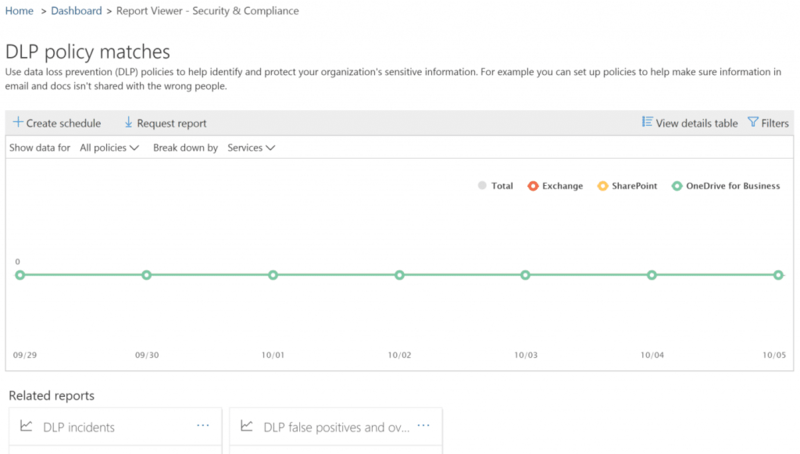 The Office 365 Security and Compliance Center offers reports that show how often policies were matched over a period of time and the number of false positives and overrides. 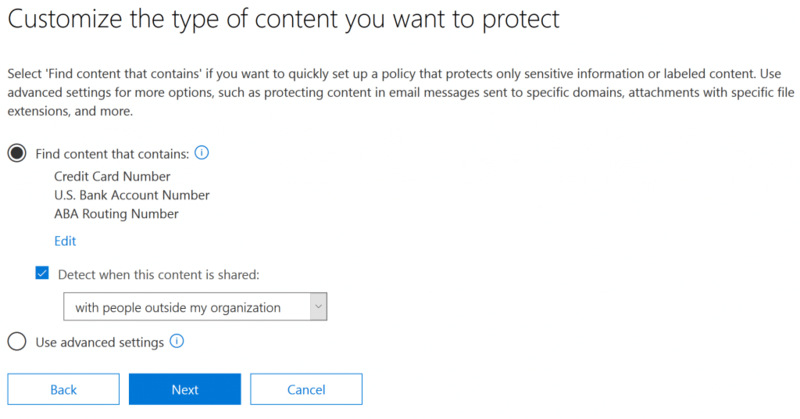 You can filter on policy matches that hit in Exchange Online, OneDrive for Business and SharePoint Online, and you can also filter on severity, who the potential violator was and what action was taken. With increasing adoption of the cloud, solutions that protect sensitive information and prevent its disclosure are more important than ever. Office 365 DLP can be a valuable first step for organizations.